Home BOLLYWOOD Watch: After Salman Khan, Katrina Kaif Enthralls The Massive Crowd! [tps_footer]Bollywood actors Katrina Kaif and Aditya Roy Kapur are leaving no stone unturned for the promotions of their upcoming film ‘Fitoor’. With back-to-back promotions, the two stars landed up at the Amity University in Delhi for the promotions. Both the co-stars, who are rigorously promoting their film, gave a grand treat to the Delhites earlier today and you won’t believe, thousands of people gathered to catch the glimpse of their favourite actors. Yes, it was unbelievable to see thousands of students and fans gathered at the Amity University campus. 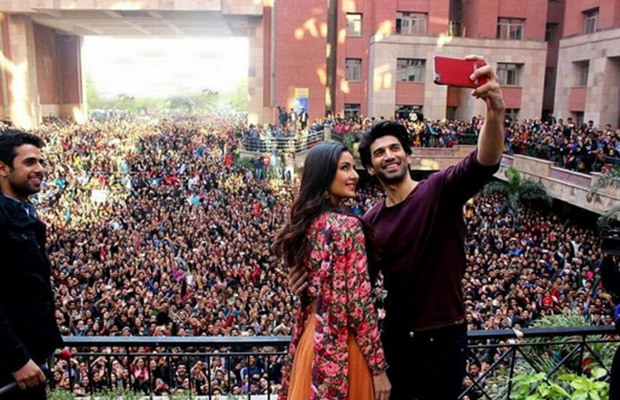 From shouting their lungs out while promoting ‘Fitoor’ between thousands of fans, to grooving on the romantic song from their film, Katrina and Aditya left the crowd enthralled there. It was an adorable moment when Aditya and Katrina grooved on the mesmerizing romantic song ‘Pashmina’ from their upcoming film ‘Fitoor’, which is based on a passionate love story. The madness and the craziness amongst the fans was truly visible. This is not for the first time, earlier, when Salman Khan too promoted his film ‘Prem Ratan Dhan Payo‘, thousands of people gathered to catch the glimpse of the actor. Salman Khan received unstoppable support and love there and it seems Katrina has received the same now after following actor’s footstep. Talking about upcoming film ‘Fitoor’, directed by Abhishek Kapoor and produced by Siddharth Roy Kapur, the film stars Aditya Roy Kapur and Katrina Kaif in the lead roles. It’s a passionate love story based on Charles Dickens’ novel Great Expectations. The film is all set to release on January 12. Previous articlePhotos: All India Bakchod Takes A Dig At Himesh Reshammiya’s Teraa Suroor And Its Hilarious! Next articleAirport Diaries: Ranveer Singh, Deepika Padukone, Irrfan Khan And Others Snapped!